My new blog is called “Souls in the Sandbox” and can be found here. I hope you’ll come join in the conversation over there! Indeed. And if there are many manuscripts out there, how many more blogs are out there in the world today? Somewhere upwards of 133 million, evidently. It’s insane. The world is flooded to choking with blogs, and we all need shoes more. And yet I blog. I’ve been blogging here now for well over two years, and on I go. Thousands of Christian moms blog on parenting, and oodles of them do it way better than me. But after wondering about it and praying through what the heck I’m doing here exactly, and if it’s worth it (1 woman among 133 million), I’m still here. God’s given me ideas and the words to express them, and I’m a better person and mom when I do that. Truth crystalizes at the keyboard. The blurry comes into focus. It’s how He made me and a huge part of how He shows up in my life, so on I go. The surprising part is the New Beginning part. After blogging here for two plus years about the young lives that reside here – new beginnings in the form of our four sweet faces – the blog itself is getting ready for a new beginning. I wasn’t looking for that and didn’t expect it, most of all in a season of having just added a fourth child and a homeschooled kid to the mix. But our God is a surprising God at times, isn’t He? And He’s been pretty clear about this, so off I go. New name, new look, new level of web-engagement, searchability, and potential exposure… Though same topics, same tone, same me. It’s a bit exciting, to be honest. So here’s to a different kind of new life being born within the next week or two. Kind of interested to see where God might go with this in His time. I sure hope you’ll come with me to find out. And that’s the truth. I wish I were a more naturally gentle person. And I wish I were more gentle with my children in my mothering. Don’t get me wrong, I have my gentle moments, and there are lovely quiet, warming moments that my kids and I do share. Moments in which I am (as dictionary.com states) “kindly, amiable, not severe or rough.” They just aren’t as plentiful as I’d like, not by any stretch. –Announce the pending Kindness Celebration, suggesting a trip to the store to pick out all the ingredients for custom-made ice cream sundaes. Rousing approval of that notion. –Read the second half of the items on the Kindness Chart aloud, again praising the kindnesses shown. –Allow each child to share which kindness documented on the list s/he most enjoyed doing. 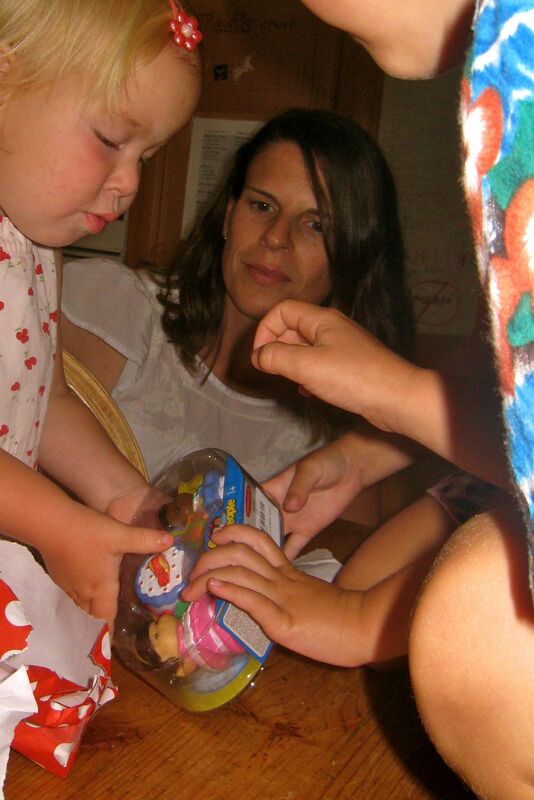 Then allow each child to share which kindness s/he most enjoyed receiving. Finish by having everyone at the table recite the Bible verse together. We all know that positive reinforcement is important, and most of us have heard that it takes seven spoken praises to balance out on spoken criticism. But this exercise was an amazing opportunity to remember and specifically call out right actions performed by our children and actually celebrate them. To encourage the good and selfless moments that take place in sibling interactions, seldom though they may be in a given day. It was a chance to reinforce the good my husband and I see in our children, and to make a big deal about it. It was a perfect example of the kind of “building others up” that Paul talks about in Ephesians 4:29. Our kids were very built up by our little party and its events. And it gave them a chance to actually experience how good it can feel to do kind things for other people – not just in the doing of the kindnesses, but in the remembering of them. This project was such a success that I’m contemplating covering several of the fruits of the spirit in this manner. Up next will, I think, be self-control as that is one area that our kids could use a lot of work. Stay tuned for more. I was thinking this morning about reputations, and the importance of having a good one. This came to mind for two reasons. First: I’m using a new babysitter this morning for the first time. And second: it’s my son’s first day of (a type of) school. And in both cases, the concept of reputation comes into play in a big way. This year my son is participating in a Christian homeschool academy called Artios that meets every Monday morning from 8:45 to 12. This morning was his first day of school, and he was excited and nervous, as every kid is on that auspicious occasion. As we were driving up in the car, we talked through the school’s rules again and reviewed the kind of student he needs to be. Attentive, polite, respectful, obedient, etc. “Is it ok to be mean to other kids or to tease people?” I asked him. “What if the teacher tells you to do something you don’t want to do?” And the like. Surprisingly, he was very interested in this and wanted to ensure that there were no other rules he needed to know that we hadn’t covered. We talked about the importance of timeliness, and I assured him that I’d see to it that we arrive on time – despite traffic – because yes, being on time matters. When I pick him up afterwards and we debrief the morning, I will ask him about these things as part of the conversation. When my husband and I did our pre-marriage counseling back in 1999 with our mentor couple – the pastor who married us and his wife – we took a personality test. The results indicated that we were polar opposites, which – with the blind naivete so typical of new love – I entirely disbelieved. We had so many striking similarities, after all. We were cut of the same cloth; soul mates! It didn’t take too long into our married life for me to realize that the test was right and I was wrong; my husband and I are night and day. Opposites did, in our case, attract — and they still do. I am an extrovert with a strategic thinker’s mind, and he is an introverted dreamer. Last year I was introduced to a book called The Temperament God Gave You, and when I read the two-page summary description of the melancholic, I about dropped the book. It was as if somehow had interviewed my husband comprehensively and written a thorough description of his personality and inclinations. The insights I found there were actually very helpful – to me and to him – and we found the book so useful we bought a copy for later reference. Two weeks ago I was watching my nearly four-year old daughter and the “recital” for her ballet show (quotation marks not gratuitous). As this tutu-clad group of pre-ballet girls wandered vaguely but adorably around the room vaguely following the directions of Teacher Pam, my daughter stood shyly in the back with her hands in her mouth. It took her nearly ten minutes to begin participating in the group, though once she did involve herself she gave herself to it and enjoyed it. When I spoke with Teacher Pam afterwards, she said that she spent a lot of time watching for the first few classes and eventually, though coaxing, warmed up to the group and the activities. My friend, after a week of teaching my daughter’s vacation bible school class earlier in the summer, indicated the same thing: “She tends to hang back a bit and watch everything, taking it all in.” And yet, she was content, behaved appropriately, and had nothing but enthusiastic reports about both experiences (ballet and VBS). The green and white checkered dress she wore with the little harness top as she wandered barefoot on the sidewalk was enough to melt my heart. We picked it up some place by way of hand-me-down; it’s no hand-sewn gem by any stretch. And yet that sweet fabric, against her strawberry blond hair with her chubby little biceps swinging free… it’s absurdly adorable. Sitting with her sister and rolling a ball back and forth across the cement, it created a snapshot in my brain that I hope will lodge there forever. In that instant I saw fully for who she is, the undeserved gift – beyond generous – that God gave us in her. This week she turns two. Seven hundred some-odd days of waking up with this small person in our house, sharing our moments and days with her. Her playful smile and extroverted personality, her inquisitive spirit. Her humor and show-offy antics win the affection of strangers as much as family members. “What a happy child!’ everyone comments. And she is. She is a joy. I was struck this week with the extravagance of the privilege we mothers hold in being able to know our young ones so well, have such an inside track on their development and emerging personality. I know the silence upstairs that likely means my toddler has gotten into trouble. I know the noise she makes when she needs the potty. I can interpret her cries – frustrated, hurt, angry, tired. One morning as I was translating a few new phrase of her particular “dialect” to her father – “No, she’s saying, ‘Watch this, Daddy! '” or “That means, ‘More milk please,'” – I was struck by the wonder it is to hold this role in the life of another human being. We are witnessing the unfolding of a one-of-a-kind human that God created with His own hands in His image. And no one else gets a front-row seat like this, at least not as close as ours. Nowhere near. It’s amazing. That we get to witness this process, and not only witness the development of a person but help train and direct this soul – this baby becoming child becoming adolescent becoming adult – is remarkable. Why should God give us such a privilege? He need not have. But He does. “From the fullness of His grace we have all received one gift after another.” (John 1:16) And this child, as each of my children, are truly such gifts. Happy birthday, my sweet and beloved two-year old girl. No one loves you more than your daddy and I do, except the Father above who made you. To Him be all the thanks, and all the glory.